‘Tis the season to be tacky! 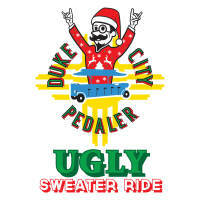 Don your thrift store finest and pedal through the streets of ABQ. If your holiday sweater is obnoxious or lights up (recommended), then this is your excuse to rock it. Raise a glass to homemade, second hand and the no-way-you-used-to-wear-that knitted wonders. Our Ugly Sweater party is the next best thing to eggnog, so saddle up for a festive ride. Plus, we got you a gift: discounts at each bar we visit. Happy ho-ho-holidays from the party people at the DCP.